Before discussing this most outlandishly named dish – cervelle de canut(s) (literally ‘silk worker’s brains’), which is basically just a concoction of cottage cheese with chopped chives – may I focus for a moment on the city it originates from and is most closely identified with: Lyon. It has long been the nerve-centre of French industry in south-eastern France, ranging from such areas as chemicals and oil refining to heavy manufacturing, food processing and biotech. It is also France’s most independent-minded city. Successive mayors of Lyon, unlike their colleagues in, say, Bordeaux, Marseille or Lille, have always tended to keep out of national politics, preferring to get on with the job of running their own city. The Lyonnais do not play boules as it is played elsewhere in the country. They have their very own boule lyonnaise, which has different rules and is often played in special clos (courtyards) tucked away at the back of cafés. They drink, traditionally, not from ordinary carafes of 37.5, 50 or 75cl, but from their own pots, which contain a wilful 46cl. Lyon is also one of France’s most secretive cities. Wealth and the pleasures of the flesh have always been enjoyed behind closed doors – or high walls. The city was for centuries a hub of religious unorthodoxy involving Rosicrucianism and even black masses. One pleasure of the flesh the Lyonnais have arrogated is gastronomy. They believe their city to be the world’s culinary capital. The Lyon Tourist Office strongly – ‘impérativement’ – urges you, if you have time to spend a whole day in the city, ‘first to choose your [lunch] restaurant, for its geographical location will determine the chronological order of events in your day.’ Clearly a sandwich for lunch is out. Silk was the other great speciality of Lyon, from the 17th century until recently, when man-made fibres took over almost entirely. When Joseph Jacquard invented his celebrated programmable loom at the turn of the 18th century, large numbers of silk workers (canuts) set up workshops in the steep Croix-Rousse district – a maze of tall, gaunt buildings interlaced with traboules (covered passages leading from one street or building to another). In conditions of Dickensian squalor, they perfomed poorly paid contract work for the soyeux (wealthy silk merchants), often for up to 16 hours a day. Women and children were frequently forced to give them a helping hand. Although the introduction of new looms invented by Jacquard resulted in increased productivity, the financial benefits went to the soyeux, and not the canuts. This situation sparked a series of uprisings in 1831 and 1834, and later in the more general rebellion of 1848. Estimates vary, but it is thought that several hundred canuts were killed in the conflicts. Paradoxically, the unrest resulted in a strengthening of workers’ mutual-benefit societies and, eventually, the setting up of industrial tribunals. The word canut, which probably derives from canne (a reel of cotton or silk), was long perceived to be derogatory by the weavers themselves. In 1832, L’Echo de la Fabrique (a journal read by silk workers) launched a competition aimed at replacing the word canut. Suggestions included tisseur (weaver), arachnéen, polymite and pamphilarien. I originally believed, Sir, that your competition to find a so-called euphonious term to describe the general class of silk workers must be a joke. I am sorry to see that you are persisting in this endeavour: why on earth should we feel ashamed of the name our forefathers bequeathed us? […] Is there anything dishonourable in the term canut? It matters little that it is used mockingly… Let us continue to call ourselves canuts! […] I propose that we close this untimely debate and strive on the contrary to lend the name canut all the glory it deserves, borne as it is by honest and hard-working men. Call your paper the Journal des Canuts. People will laugh at first, then they will get used to it, and the term will eventually become as noble as that of a banker, doctor or lawyer. And you will have achieved an act of infinite wisdom. This outburst gives us a good idea of the degree of humiliation felt by Lyonnais silk workers in the mid-19th century and the city’s deep class divisions. The first printed mention of cervelle de canut is to be found in Le Littré de la Grand’Côte (1894), a dictionary of quaint Lyonnais expressions compiled by Nizier du Puitspelu. It is clear that whoever originally coined the term around the turn of the 19th century did so with derogatory intent. Later, it came to be identified with mainstream Lyonnais cuisine and took on a positive aura alongside other local classics such as quenelles de brochet (pike quenelles), rosette (saucisson sec), tablier de sapeur (literally sapper’s apron, which consists of breaded and deep-fried triangles of tripe) and gratin de cardons à la moelle (a gratin of cardoons with bone marrow). 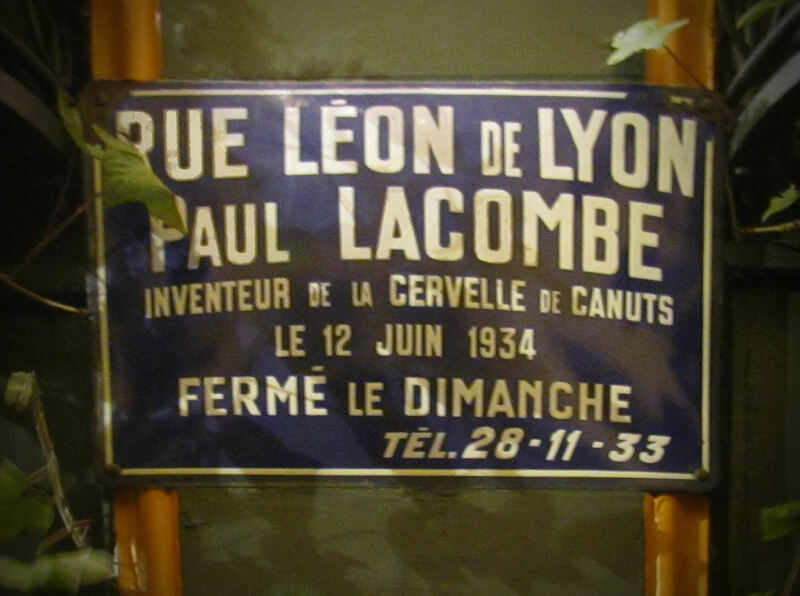 In 1934, one leading restaurateur, Paul Lacombe, even went so far as to claim that he had invented cervelle de canut himself (which was untrue). Some historians have allowed their imagination to run away with them, arguing that the cervelle of the recipe’s ingredients was seen as an ersatz for sheep’s brains, allegedly a highly prized feature of the canuts’ diet which they could not afford to eat. The notion that brains could be part of anyone’s staple diet is patently absurd. The dish itself, before its name was transmogrified into cervelle de canut, was widely consumed as an early morning snack (mâchons) by silk workers. Visiting a local street market in about 1890, the geographer Victor-Eugène Ardouin-Dumazet noted that many local farmers did good business selling their cottage cheese to silk workers. The basic ingredients of cervelle de canut (cottage cheese with flavouring) are found in many other recipes all over the area once covered by the Austro-Hungarian Empire. Outside Hungary itself, it is marketed as Liptauer, and is regarded as a rather peasanty dish, the sort of thing you might order in a Weinstube and wash down with beer or new wine. It does not often find its way on to dinner tables. A very similar dish is also to be found in Poland, where the mixture is unaccountably called błoto (which means mud). Beat the cheese and the cream vigorously together until amalgamated. Stir in the rest of the ingredients and mix well. Keep for at least 24 hours in the refrigerator (to allow the herbs to infuse into the mixture). Stir again before serving. Best accompanied by toast, rusks or boiled potatoes. And Monsieur Collomb is returning home. For the first time (on this blog) I have followed the recipe. Good results. Herbs nicely infused after the recommended 24 hours. The Norfolk goats cheese chosen (Ellingham) was perhaps over-hard compared with the default-option cottage cheese, and thus required plenty of cream, but this will have made it even richer. Went well with toast as suggested, and there's enough left over to go with boiled potatoes tomorrow. Thank you - hope others are doing the same. US President Richard Nixon like to eat cottage cheese with ketchup for lunch. With chives, it's delicious. Do you think that the cottage cheese draining in its muslin ( even possibly a silk muslin?) looked a bilt like a brain.